Our 4-week series is a must for every homeowner. Once you buy a home, it’s now all your responsibility! But are you truly prepared for the unexpected? 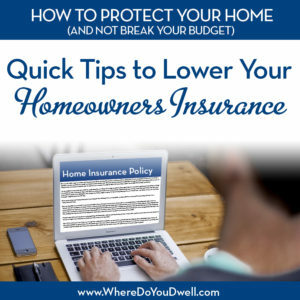 This series is a great overview on what you need to know when it comes to getting homeowner’s insurance, keeping your home safe and secure, and avoiding costly mistakes when protecting your home. Don’t ever just “rubber stamp” your homeowner’s insurance policy before you renew! How you live in your home and what possessions you own can change from year to year. It’s always a good idea to reassess your needs and consider any changes in your home that could affect your insurance rates and coverage. Before you sign off on that annual renewal, make sure you are fully covered for your current situation but also see where you can save money. You might be able to take any savings and put it toward additional coverage you need now. You may qualify for certain credits that could lower your premium but you’ll still get the coverage you need. As always, please talk to your insurance agent for more details. Shop around. Quotes on homeowners insurance can vary by hundreds of dollars for the same coverage on the same home. Get at least three quotes and make sure each insurer is offering the same coverage. It’s not always apples to apples. And that includes shopping with your current insurer — sometimes you can even save money by buying a completely new policy with them. Buy home and auto policies from the same insurer. Some companies that sell homeowners, auto and liability coverage will take 5 to 15 percent off your premium if you buy two or more policies from them. Raise your deductible. If you can afford to raise your deductible to $1,000 from $500, you may save as much as 25% on your annual premium. Avoid making claims under $1,000 so that your rates don’t rise. But, just remember you’ll pay more out of pocket if you ever need to make a claim. Improve your home’s security and safety. Install a smoke detector, burglar alarm or dead-bolt locks and you may save at least 5 percent. Some companies may cut your premium by as much as 15 or 20 percent if you install a sophisticated sprinkler system and a fire and burglar alarm that alerts the police, fire department, or other monitoring stations. These systems aren’t cheap and not every system qualifies for a discount, so check with your insurer first. Even Smart Home devices, such as a programmable thermostat, could be considered for a discount since it could help prevent frozen pipes. Ask you insurer about any products or services that may qualify. Maintain a good credit record. Insurers are increasingly using credit information to price homeowner insurance policies. In most states, your insurer must advise you of any adverse action, such as a higher rate, at which time you should verify the accuracy of the information. Stay with the same insurer. If you’ve kept your coverage with a company for several years, you may receive a special discount for being a long-term policyholder. Some insurers will reduce their premiums by 5 percent if you stay with them for three to five years and by 10 percent if you remain a policyholder for six years or more. Review the limits in your policy and the value of your possessions at least once a year. You want your policy to cover any major purchases or additions to your home. But you don’t want to spend money for coverage you don’t need anymore. Some items depreciate over time so review your policy annually so you don’t have too much coverage. Don’t forget to review the riders on any special items such as jewelry, artwork, electronics, or other high-dollar items. Upgrade older features in your home. If you have an older home update your plumbing, electrical and heating and/or air conditioning systems to prevent fire or unwanted leaks. You’ll be less risky and can reduce your rates. Also talk to your agent to find out if there are other upgrades you should consider. Look into water and gas leak sensors. Insurance companies may lower your bill because these devices help prevent claims since you’ll know there’s a problem before there’s major damage. This new generation of home sensors can alert you if there is moisture or a gas leak in your home and many can be self-installed. Active water detectors can even shut off the water source! Don’t insure the land. Homes can be damaged in fires, floods, and other mishaps, but there’s not much that can go wrong with land. Purchase enough insurance to cover the value of your home, and let the land take care of itself. Give up smoking. Insurance costs more for smokers because of an increased risk of fire-related claims. If you smoke, and are serious about lowering your bill, consider quitting. If you were a smoker when you took out the policy but have recently quit let your insurer know. Make payments electronically. Many companies now charge for mailed payments, so have your payments automatically deducted to shave that cost. Reconsider a pool or hot tub. These may or may not impact your premium depending on where you live so talk to your agent before you get one. If you already have one, discuss the measures necessary to decrease any risk. Double check dog breed/obedience training. Certain breeds will either cause your insurance company to cancel coverage or increase your insurance rate. So you might want to find out which breeds affect insurance rates before you get a dog. If your dog attends obedience training, let your agent know and it can mitigate any increases. Here’s another must-do tip: This one may not save you money on your policy, but it could help you substantiate a claim! When you start to review your current policy, it’s also a good time to take photos and take stock of the items in your home. That way you’ll be prepared and have proof if ever need to make a claim. This is especially important if you have some unique or expensive items. Last but not least, we are always here to help, but this article should not be taken as insurance advice in any way. Please talk to your licensed insurance provider to make sure you have the right coverage for your particular situation. Think of using this article more as a guide to help your conversation with them so they can help you make the right choices.